D.A.Printers are Kent’s only manufacturer of continuous stationery and supply many end users as well as being a trade supplier to other local printing companies. Our press is a British built Morgan 904, and enables us to print from reels of paper at speeds of over 350 feet per minute. This machine can colour the paper, print on both sides, punch holes and perforate all at the same time with various options available for extra perforations and even consecutive numbering. 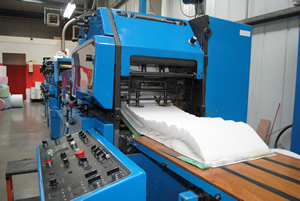 For customers requiring high volumes of pre-printed, laser compatible sheets we can run the web through high speed sheeters delivering perfectly trimmed A4 sheets ready for your laser printers. If you require cut-sheet, multi-part NCR forms we can produce these and finish them as either individual sets, glued into pads or stitched into books. Large orders can often be produced for less than other printers can buy the paper! Continuous stationery (UK) or Continuous form paper (USA) is paper which is designed for use with dot-matrix printers and line printers. Other names for continuous stationery include fan-fold paper, sprocket feed paper, burst paper, tractor-feed paper, and pin feed paper. It can be single ply (usually woodfree uncoated paper) or multi ply (either with carbon paper between the paper layers, or multiple layers of carbonless copy paper). We are able to provide a wide rage of sizes. Please see the table below. DA Printers is a superb printing company which always gets the job done on time and to a high standard. We often ask them for something to be done at very short notice, and they have never let us down – whether it’s magazines, programmes, flyers, signs, posters – you name it! I would recommend DA Printers to anyone! Contact us to request your secure private file share.